This will be a unique opportunity to view a documentary on Freemasonry at Century 10 Theatres on Monday, January 29th at 7:30 p.m. Please consider supporting and attending this if you can. See the message from Bro. Russell Wolf below. 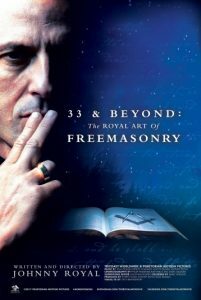 I have been given the opportunity to bring the movie 33 & Beyond, The Royal Art of Freemasonry to Century 10 Theatre in Fargo, ND on Monday, January 29, 2018 @ 7:30 pm. Tickets are only $10 each. I need your help in making this a success, as we need to pre-sell tickets online and meet the goal of 65 tickets in order for it to be premiered. Please reserve your tickets online as soon as possible. This is going to be a Dinner & Movie Premier night with my family & friends and I encourage you all to do the same. If you have any questions, please call me 701-526-6187. Follow the link below to purchase tickets. Help me spread the word by sending this email to all your friends, family and Brothers and posting it on social media also! Thank you and I look forward to this great event! For website related issues, please contact the webmaster, Travis Cuypers, using the Contact Us form. Copyright © 2019 East Gate Lodge. All Rights Reserved.